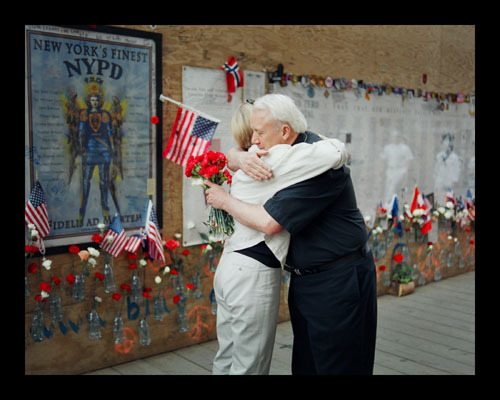 Use the links below to view picture galleries of the Ground Zero Memorial. 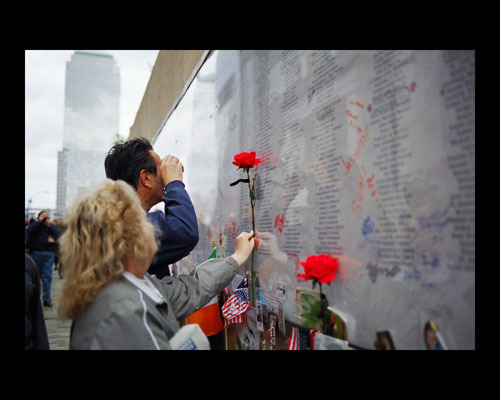 First installed at the Public Viewing Platform at Ground Zero, this was the first September 11 Memorial of its kind to pay tribute to all the victims of the terrorist attacks on the World Trade Center on September 11, 2001, including those on American Airline Flight. 11, United Airline Flight. 175 along the victims of the 1993 terrorist bombing. 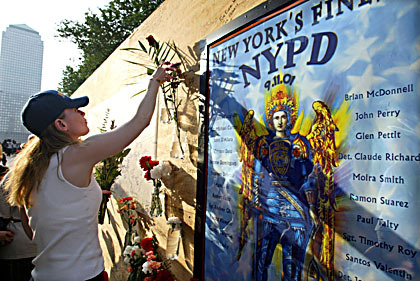 Adorned with flowers, offerings and patches of uniformed officers, the first Ground Zero Memorial installation became a living thing and a testament to the compassion and sympathy of the community and family members that visited the Memorial. A place of honor and remembrance. 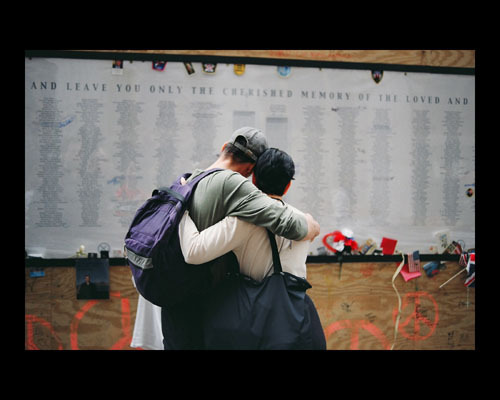 A couple visiting the platform embrace to comfort each other while viewing the names of those lost on September 11. A sacred place of comfort and solace. While handing out flowers to visitors, Fr. Rand Frew taks a moment to comfort a visitor. A place of great sadness. On Memorial Day, ArtAID provided 3000 red carnations to be installed on the platform, a flower for every name. 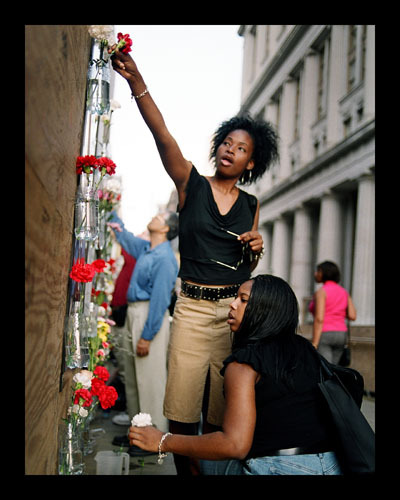 The Ground Zero Memorial became a Living Thing. 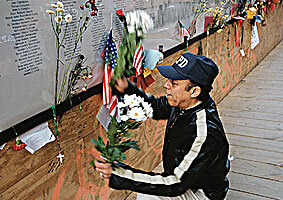 A flower for everyname, a symbolic rememberance for victim was placed on the wall by ArtAID volunteers for Memorial day 2002. The public viewing platform offered visitors to Ground Zero a first look the World Trade Center site. Tens of thousands of curious onlookers from all parts of the world walked the 300 foot ramp daily from January thru July 2002. 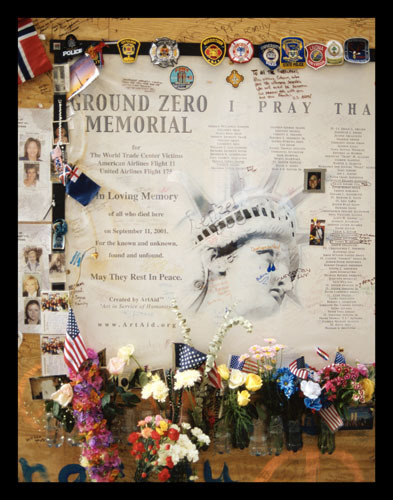 Community affairs officers and recovery workers were concerned that had quickly become a tourist destination and asked ArtAID to create the Ground Zero Memorial to remind them of the sacred nature of the site. 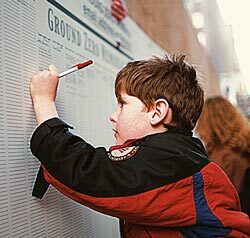 Boy signs Ground Zero Memorial Guestbook. 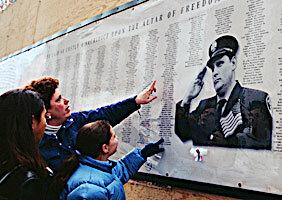 This Memorial provided visitors with a unique "interactive" experience. Every day new flowers were contributed and are maintained by ArtAID volunteers. Resident volunteer Eric Oxendine places flowers on the Memorial. 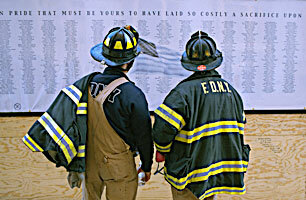 Firefighters working at Ground Zero in the recovery effort were among the first to view the Memorial. We did it for the families, for their loved ones, that they never be forgotten. 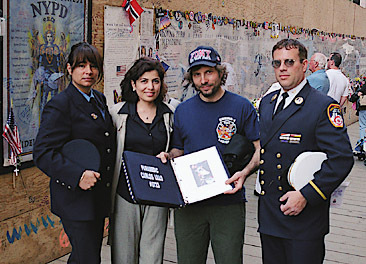 FDNY Paramedics in full uniform and Cecilia Lillo, who lost her husband FDNY Paramedic Carlos Lillo, shown with the artist of the Memorial. 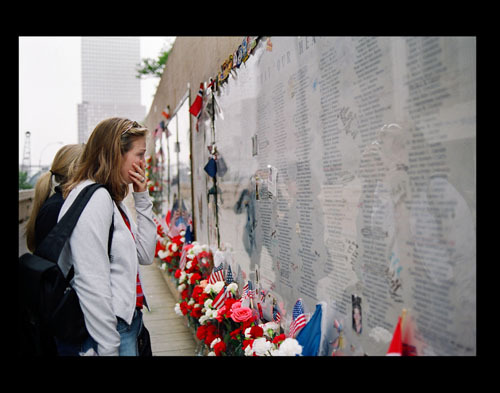 Like the Vietnam Memorial in Washington D.C., the Ground Zero Memorial gave visitors a chance to touch the names of loved ones. 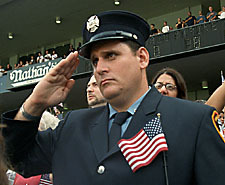 An amazing photograph of a sad firefighter taken at the first official memorial service given at Yankee Stadium just weeks after the attacks is very appropriately included in this sensitive and beautiful Memorial.